Bus Rides in Cuenca, Ecuador – Be Careful!! 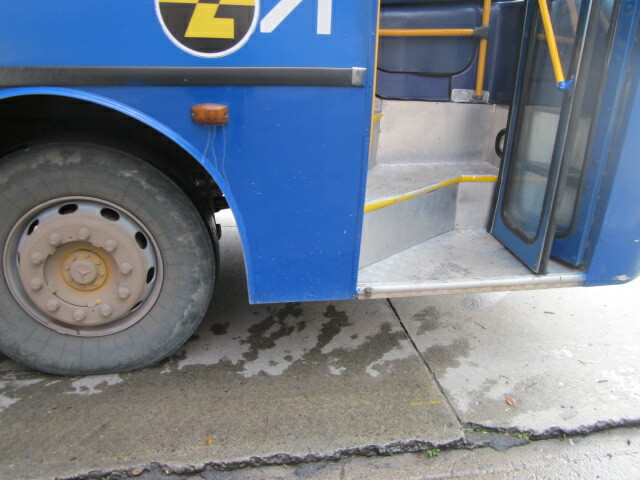 As any Ecuadorian or non-Ecuadorian who lives in Cuenca will tell you, BEWARE when you ride a city bus or cross a street. If you fall or are hit, it will be your fault. You are not legally or medically protected by the company, person or vehicle that caused you injury, unless you come from one of the city’s powerful families. But of course, if you are from one of the city’s powerful families, you will not be taking public transportation; you’ll be in your own SUV or taking the Radio Taxi. In Cuenca, it’s true – you take your life into your hands riding a bus. How do I know? On January 25, I descended from Bus #13, on my way back from Coral Centro (a popular place to shop for sundries and food). One foot, the first one off the platform, was about to hit the ground, when the driver took off. The drop to the ground from the bus is an average of 2 feet in the older blue buses. I landed on my wrists and my left side. I was dazed and confused, not able to move for some time. Now you are wondering… am I old, am I disabled, am I clumsy? I would think not. As anyone who has witnessed me norteño dancing to a Mexican version of Irish Riverdance can attest, I am light of weight, nimble, and fast on my feet. So what happened? Was this an isolated incident? Sorry to say, it was not. Many drivers take off before you are safely off the bus. They do this every day. Such situations occur for Ecuadorians and non-Ecuadorians alike. Imagine being a tiny (under 5’) indigenous woman carrying heavy burlap bags on your back and in your hands? Or a mother with a child in her arms? Or a middle aged woman whose coat gets caught in the door as she is on the ground and she gets dragged along the road to the next stop ¼ mile away? Apparently, this happened to one ex-pat. What if you have a disability? If you have an ambulatory disability, you will not be riding the bus – no way to get a wheelchair on board, and too high to step into if you are wearing a prosthetic device. If you are elderly, you walk or take a taxi, that’s if you can afford a taxi, most seniors cannot. What to do if this happens to you? You can report the incident to the police, or to the owners of the bus. This means knowing the exact bus number and time of the accident. Will there be any changes or interest in you? Unlikely for now. Why? Because this is how it has always been. My understanding is that some of the city’s wealthy families own the buses. Their drivers are paid minimum wage or slightly above minimum wage. The drivers are rarely screened, nor trained in public safety. The blue buses (don’t be deceived by photos) are rickety, dirty unless washed during a holiday such as “Carnaval”, and, they spew black diesel fuel into the air contaminating the environment and possibly affecting your health. But this is a developing country and better some transportation than none. Fortunately, three years from now, there will be an electric trolley system around the periphery of the central district, El Centro, and public safety issues may be improved. The President and Vice President are acutely aware of public health and public safety issues regarding buses and factory conditions and are working with great dedication and diligence to improve the situation throughout the country; their challenge is enormous. But as in any nation, awareness requires a change of public attitude; when you are conditioned to accept “abuse” as normal, such awareness takes time. As of yet, I am told, there are no laws regarding bus companies and driver responsibility, though safety laws are gradually being implemented in factories. In Europe or North America, the driver of bus #13 would have been suspended, fined, or lost his job, and the owners would have seen to it that you were cared for. I am lucky. Even though I was three days and nights with a wild headache, cuts and bruises, very sore from my left foot to my left hip, and hobbling along, I could eventually walk again. It took two months to heal. But why didn’t the driver stop or anyone from the bus help? I believe I must have let out quite a yelp. A few days after the event. a lovely American nurse friend who heard about it sent me to an intuitive, healing Ecuadorian physician. Conclusion: I suffered severe shock, no broken bones. What was the lesson? Always pay attention to who is driving the bus, or if you can afford it, opt for a taxi. If the bus driver takes off without speeding, stops slowly and starts slowly, plays gentle melodic music, and greets you when you get on, it is likely he will be a balanced person and you’ll be safer. If you perceive that the driver has anger management issues, pay attention! Pay attention to his energy. Had I paid attention to the driver of Bus #13 on the first trip to Corral Centro (same driver on the return trip)when he suddenly pulled over in front of “Bazaar Melodie” on Avenida de las Americas to flirt with a girl selling bananas, I might have realized this man had serious issues. Three times the smiling girl brought him different stalks of the fruit. The third time, as he fished for coins to pay her and realized he didn’t have any, he stormed off by accelerating fast; jolting everyone on the bus; his rage filled the air. If there had not been torrents of rain and wind that afternoon, plus my eagerness to get to where I was staying, I might have waited for the next Bus #13 with a different driver for the return trip. 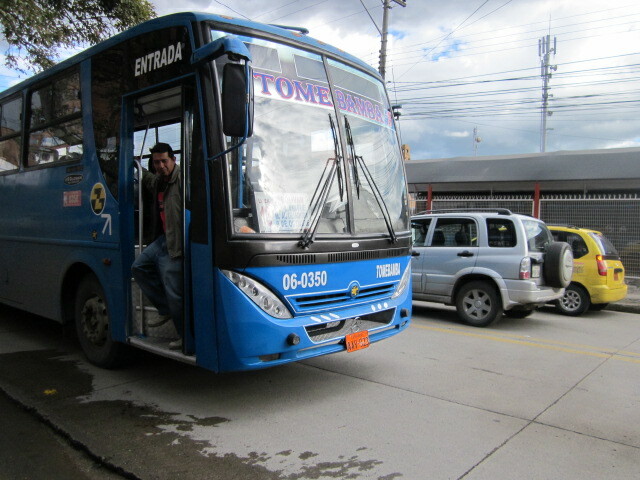 If you decide to venture forth and ride the Cuenca buses, go to http://www.cuencatransit.com for more information; the web site is in English. There are signs for seating intended for persons with disabilities and for seniors in the buses. On the back of many Cuenca buses are billboards advocating no violence against women, asking men to respect all women. “City bus operators say that the 25 cent fare they charge passengers isn’t enough to maintain Cuenca’s fleet of almost 500 buses. The current fare was set a decade ago and doesn’t account for inflation. They also complain that they were not involved in decisions regarding the city’s new light-rail system, particularly the one to reduce the number of buses in El Centro.” (The light-rail system will not be up and running for 2-3 years).